Modeling Jobs>Print Modeling Jobs>Looking for Indian women of all ages! 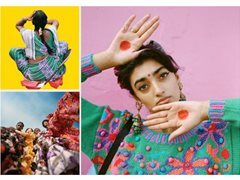 Looking for Indian women of all ages / or a family for a paid shoot in London for a major image library. Shoot will be celebrating the beauty of the Saree. This shoot will be colourful, playful, modern and poetic shot in a London studio! Looking for 6 women of different ages who own their own saree's. Could be a family of friends - all sizes / heights required, Celebrating women and culture!